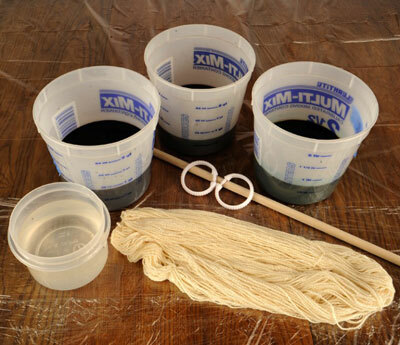 When you dip-dye yarn, you apply color to the skeins by dipping them into containers of dye mixed with acid. Working with dyes can be dangerous. So be sure to follow the all safety precautions. Protect your skin: Wear rubber, latex, or nitrile gloves when mixing dye solutions or when adding substances like salt or acid crystals to a dye bath. When working with a simmering dye bath, wear insulated thermal gloves designed especially for dyers. Use hot mitts when handling hot cooking tools. Protect your lungs: When mixing dye powders into solutions, there is great risk of dye powder molecules becoming airborne. Since acid dyes have an affinity for protein and human bodies are largely comprised of proteins, you must reduce your exposure to dye in all forms, but especially in powdered form. Wear a particle filter mask whenever handling dye powders or any powdered dye material. You should also wear a dual cartridge respirator mask filled with acid gas cartridges to protect your lungs from irritation caused by the acid vapors of simmering dye baths. Check with your dye supply company to be sure you use the correct type of mask. When mixing dye powders, turn off fans and close windows to avoid air movement. Cover your work surface with paper towels, and lightly dampen the paper with water from a spray bottle to trap any loose dye particles that spill before they become airborne. You also can create a mixing box lined with dampened paper. When cooking your dye baths, good ventilation is important. Turn on vent fans and open a window. Protect your eyes: Wear safety glasses to protect your eyes whenever you are working in the dye studio. Unless otherwise instructed, prepare your dyes the day before your dye session so they will be room temperature when used. Hot dye solutions strike quickly. For the process described here, you soak your fibers in an acid presoak to wet out your fibers. This step alters the pH of the fiber so it can accept the dye. In some instances, you may need to add acid to the dye solutions. To make the presoak sufficient for 1 pound (454g) of fiber, add 12 tablespoons citric acid crystals and 4 teaspoons (10ml) Synthrapol to 2 gallons of warm 95°F (35°C) water. Stir to combine. An acid presoak can be reused and stored indefinitely if you keep a lid on the bucket. If you ever need to add water, you may also need to add more citric acid crystals to maintain the proper acidity level. Check the acidity of a stored presoak solution using pH test papers. Tear a strip of paper from the roll and swish it in the solution. Then match the color with the guide. The pH of the acid soak should be in the range of 3–4.